At Microsoft, we believe in empowering every person and every organization on the planet to achieve more. Our CEO, Satya Nadella, has spoken about how essential it is that we push the boundaries of what technology can do in a concerted effort to be inclusive of everyone around the world. These principles have the deepest impact in how we are building products that are designed for everyone. We have been on a journey of inclusive design, which celebrates and draws inspiration from people who are often overlooked in the typical design process. As discussed at the annual DICE conference last February, when we truly design for all, we help make the world more equal. That's why we created a piece of hardware which we believe will enable and empower gamers across the globe: The Xbox Adaptive Controller. By taking an inclusive design approach and considerations of gamers who might not be able to reach all the bumpers and triggers or hold a controller for an extended period of time, for example, we were able to design a controller that provides a way for more fans to enjoy gaming. On our journey of inclusive design, we have taken a wider view of our fans and a more inclusive approach to designing for them. 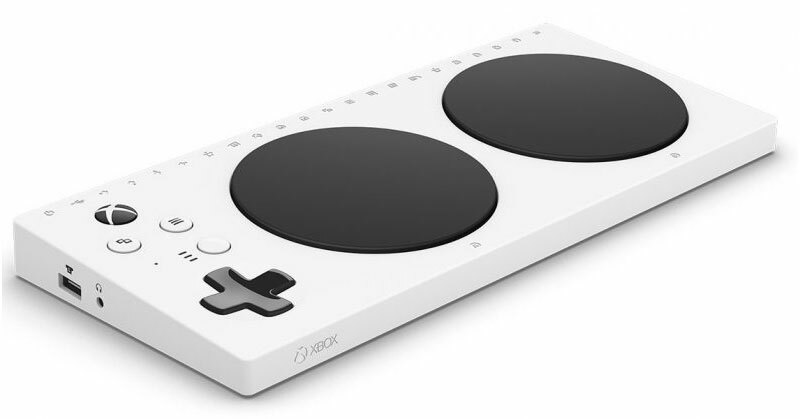 Joining the Xbox family of controllers and devices, the Xbox Adaptive Controller was created to address these challenges and remove barriers to gaming by being adaptable to more gamers' needs. It was developed in partnership with organizations around the world, including The AbleGamers Charity, The Cerebral Palsy Foundation, Craig Hospital, SpecialEffect, and Warfighter Engaged. 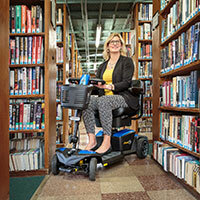 We worked closely with them and directly with gamers who have limited mobility to assist in our development. Our goal was to make the device as adaptable as possible, so gamers can create a setup that works for them in a way that is plug-and-play, extensible, and affordable. In addition to working with common adaptive switches that gamers with limited mobility may already own, it has two large buttons built in. These buttons can also be reprogrammed to act as any of the standard controller's button inputs via the Xbox Accessories app. In addition to the device itself, we also redesigned the packaging to make it accessible for people with limited mobility. Beta testers and user experience respondents were invaluable in the creation of this packaging; their feedback directly informed features such as a hinged lid, loops in every major step of the unboxing, and an open space under the device so people can slide the controller out more easily. 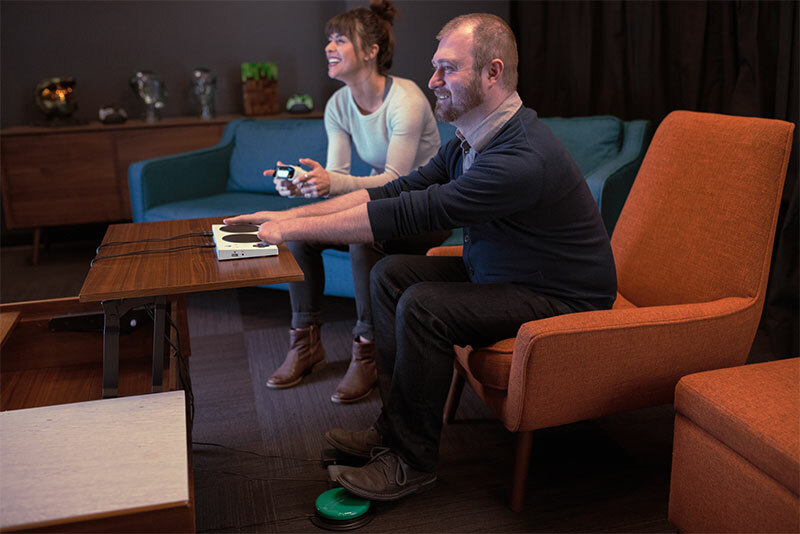 To make the Xbox Adaptive Controller a viable solution for the widest possible range of gamers with limited mobility, we've worked closely with third-party manufacturers to support external inputs which can be plugged in to the new controller. These inputs include PDP's One-Handed Joystick for the Xbox Adaptive Controller, Logitech's Extreme 3D Pro Joystick, and Quadstick's Game Controller. We couldn't be prouder to have their support in introducing the Xbox Adaptive Controller. More recommended partner devices can be found here. 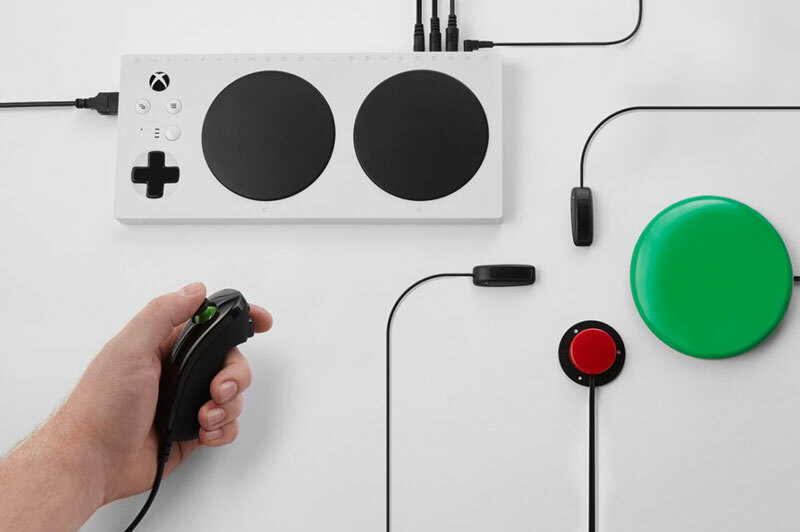 The Xbox Adaptive Controller has been years in the making, though we realize that this is only one step along our journey of inclusive design and that we have more work ahead. This has been a passion project for people around the world, both inside Microsoft and beyond. We're thrilled to share it with the world, tell the story behind it, and take what we have learned on our journey to inform future initiatives in inclusive design. This controller will be available for attendees to test drive at Abilities Expo Toronto in the Microsolf booth #216, April 5-7, 2019.